On the 8th of June 1913, a woman stepped out onto a race course at the Epsom Derby. Sadly, she was knocked over by the horse and killed. The woman's name was Emily Davison - She was a suffragette. Emily Davison was a 40 year old woman who protested militantly for the emancipation of women, she was jailed on 9 occasions and force fed 49 times. On the fateful day Emily had bought a return train ticket and a ticket for a dance in the evening. There is some debate surrounding her death. Some argue that Emily committed suicide to become a martyr to the cause whilst, others argue she was trying to cause disruption the race to highlight her fight. 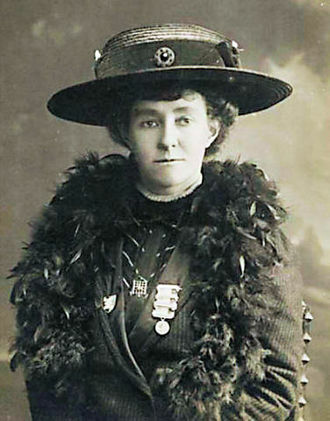 Read more about Emily Davison here. Listen to the song, ask children to watch the film and listen to the lyrics - what do they think it is about? Play it again whilst pausing and asking the following questions. Pause at the end of line 4 - Who is telling the story? Is it a boy or girl? Old or young? how do we know? At the end of line 10 ask - where is the boy sitting? Why has his father sat him on his shoulders? Pause at the end of line 20. What time of year do you think it is? Why? Where are they? What are they watching? Pause after line 22 - What has happened? Make predictions. After line 30. Ask the children what has happened? Do we know more details now? After line 35. is it something bad that has happened? How do we know that it is quite back? Was it the horses coloured this way? What do we think the medals are for? 9 medals. The 9 times she was jailed for the cause. What does she mean by 'Let me live, or let me die' why does she think she is not really living? If she doesn't have the same rights as a man she is not living a full life. I tugged my father's coat sleeve And said "I cannot see the track"
You can wave and scream and shout. Those horses thundering round the bend flashed purple, green and white. He threw me from his back. "Let me live, or let me die!" I shall be free on Derby Day"
Rewrite the episode as a recount. Write the narrative as a news report. Write a description of what it felt like being on your father's shoulders. As if you are really high - like being on the back of a giant. Use similes for description. Whilst on father's back describe the crowd scene using prepositional phrases. Give the children characters to portray, children who saw it from their father's back, the king whose horse was injured, some one who heard about the event but didn't see it etc. Would a rich gentleman's point of view be different to a fellow Suffragette? Compare the lyrics with newspaper reports of the day are the lyrics accurate? Research Emily Davison and make a judgement whether or not you think she committed suicide. Research the Suffragettes and create explanation texts about the movement, its members and society at the time. Discuss 'Freedom' and what it means to the children. Organise class votes on subjects close to the childrens' hearts but perhaps deny the girls/boys the right to vote. Would it change the outcome? Discuss why 'emancipation' was so important to these women.